The Meadowlark Farm Pick-your-own Apple Orchard and Pumpkin Patch! When are the peaches, produce & pumpkins ready? 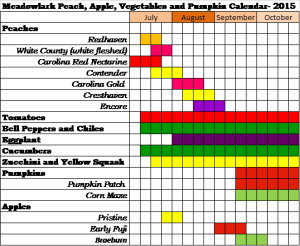 Click on this calendar to see most of what is growing in 2015 at the farm and roughly when it will be available. If you are really counting on getting anything specific, then please call in advance to make sure we have it!